Laser coding technology has been around for decades in the packaging world, and many of the early systems had some significant limitations when it came to speed, longevity, print capabilities and substrate compatibility. But, thanks to recent innovations, the laser coders of today are light-years from their humble predecessors. They’re fast, agile, versatile and ready to connect to the Industry 4.0 world. 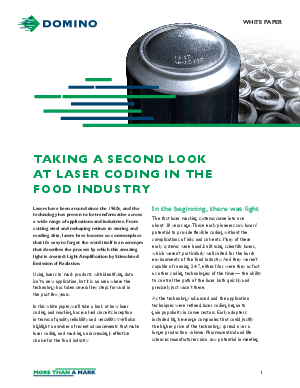 This white paper from Domino takes a look at how laser coding and marking has evolved since its inception in terms of quality, reliability and versatility. It also provides a list of important questions food manufacturers and laser coding providers should be asking each other to ensure that a productive, sustainable solution is implemented.